A photo collage is a little work of art made up of the most beautiful photos. And for all those of you who want to make your own collage, there’s good news. This website makes making your own photo collage a breeze. Even if you’ve never done it before, you can create your own collage online very simply. You can make your own collage in just a few clicks. Tip: We offer more than 250 FREE photo collage templates – also for special occasions. Creating a photo collage online has many advantages over software. Hundreds of collage templates are available online and the collection is constantly updated and expanded. This means the selection is always up to date. If you want to create your own collage, you will start by uploading the photos you want to use from your computer into the internet. This can take a few minutes, depending on your internet connection. Then nothing more stands in your way. Once all of your photos have been uploaded, the program starts automatically with the creation of your photo collage. All photos are immediately inserted into the photo collage template you selected. Using this function saves you a huge amount of time and means that you don’t have to insert each photo one by one. This is particularly useful when you want to make your own collage using many photos. But of course you can still design and edit the photo collage yourself. Even if the photos have been inserted automatically, you can still move them around and arrange them another way. The photos can also be cropped and the colours changed. This gives the user the opportunity to edit the photos comprehensively even after uploading. One particular feature of this editing option: making a black & white collage. Did you know? You can have your finished collage printed on to canvas. If you want to create your own photo collage, our collage creator has over three hundred different collages to choose from. In addition to collages with up to 100 photos, we also offer attractive design collages and collages with text. The selection in our photo collage creator is huge. The collage creator’s text templates are a particularly good choice for photo collages because these photo collages can be supplemented by a personal message. They are particularly suitable for conveying greetings and congratulations, e.g. for an anniversary collage. But if you are making a text collage, always be sure to double-check what you write. Ensure that everything is correct before you print. After all, spelling mistakes in large format are pretty embarrassing! Creating a photo collage yourself can be challenging, especially if you are using many photos. Not only uploading the photos but also arranging the individual pictures can cost time. However the templates with many photos are very popular when it comes to making collages. The reason is very simple: These collages have plenty of room for lots of pictures. If you have these photo collages printed out, you’re getting lots of pictures for the same money. If you create a photo collage, you’ll probably want to have it printed out too. But domestic printers are usually not suitable for printing such large formats. 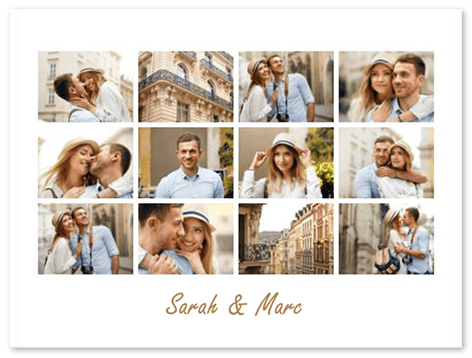 That’s why we offer our customers who want to create their own photo collages a printing service, to have these printed on canvas or as a photo collage poster, for example. The customer chooses the material and the size, and we take care of the printing. And in just a few days, your photo collage will be in your hands as a printed piece of art. Most users choose the collage canvas after using our collage creator to design the collage online. There’s a good reason for this too. The photo collage on canvas not only looks high-quality, but it is also available in many sizes and is relatively cheap. If you have a small budget for your photo collage but still want to create one yourself, the poster is an excellent choice. It doesn’t get any cheaper for a photo collage than a poster.